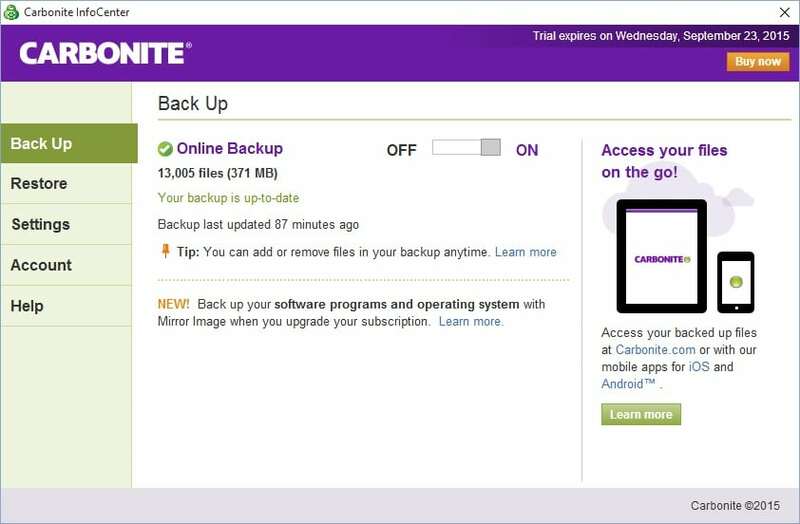 Carbonite Review 2017 | Should You Buy this Online Backup Service? Despite lacking some features, Carbonite shines when it comes to security and customer service, and at less than $10 per month. Carbonite is a cloud backup service that straddles the fence between business and personal use. In its attempt to please everyone, no one walks away entirely satisfied. That being said, it comes with a few perks that might entice a few free trial users. Carbonite has three personal tiers, three business tiers, and server backup plans. For the purposes of this review, only the personal service was tested, although we’ll attempt to shine some light on what you can expect from the other options. A yearly $47.99 (GBP 30.90) will bag you unlimited storage for one computer plus a smartphone. For $79.99 (GBP 51.51) and $119.99 (GBP 77.27), you can back up to and from external hard drives and enable automatic video backup and courier recovery, respectively. All those plans are fine and dandy, except only the lowest tier is compatible with Macs. Carbonite is a very Windows-centric company, and many of its extra features only work on Windows computers. If you’re a Mac user or the majority of your workforce uses Macs, it’s probably best to look elsewhere. Business tiers start out at $269.99 (GBP 174) per year for as many workstations, external hard drives, and networked attached storage as you can fit in 250GB of space. The second tier bumps that to 500GB and includes remote deployment and management and support for Windows file servers for $599 (GBP 386) per year. The uppermost rung, at $1,299.99 (GBP 836) per year, is the same as the second except it includes the server backup service, which on its own costs $799 (GBP 515) per year. Carbonite offers a free trial of its Personal Basic plan for 15 days, no credit card required. You won’t find many bells and whistles when using Carbonite, but what it does offer can be invaluable to the right person. Continuous backup means files are updated on the cloud as you save them, or you can choose to schedule backups on an hourly or daily basis. You can also set it to not back up files during certain hours when you need the extra bandwidth. Throttling backup speeds is an alternative way to save bandwidth and manage network traffic. During the initial backup, Carbonite can prevent the computer from going into sleep or hibernate mode. Carbonite can recover any backed up file within 30 days after “deletion,” which is mainly useful for accidental wipes or file removals. It also backs up every single version of every modified file up to three months back. Differential and incremental backups save time and space by only uploading the parts of files that have been changed. And that’s about it. Notably missing are synchronization across multiple devices, sharing files via public links, and email dropping. Security-wise, Carbonite scores above average but isn’t best in class. On a personal or business plan, your data will be 128-bit encrypted. The company says it plans to upgrade to 256-bit AES encryption on all accounts soon, but right now that option is only available on server backup plans. Carbonite gives users the option to set their own private key. This means you get an encryption unique from other users and Carbonite (nor anyone else) can decrypt your data. However, if you lose your private key, you’ll never be able to access your data again. All uploaded data is encrypted before it leaves your machine, and is protected during the transfer by SSL. Carbonite owns its own data centers and says each user’s data is spread across 15 disk drives with no less than three copies of each backup set. In the event that one of those drives fails, it can be replaced in real-time with no loss of data. Security guards and closed-circuit TV secures the data center premises 24 hours per day. To prevent file corruption, Carbonite’s software will detect bit errors and automatically instruct the customer’s computer to re-send any affected files. Carbonite says it is adding 1 million GB per month to its data centers. That’s generally preferable to buying up virtual space from a third-party provider like Amazon or Rackspace. In contrast to Carbonite’s beautiful website, the Carbonite desktop app looks dull and a bit dated. It contains five tabs: Backup, Restore, Settings, Account, and Help. Each one is fairly self explanatory and each offers some helpful tips at the bottom. When installed on Windows, right clicking in Explorer will reveal an added Carbonite context menu option to backup a file or remove it from the backup. 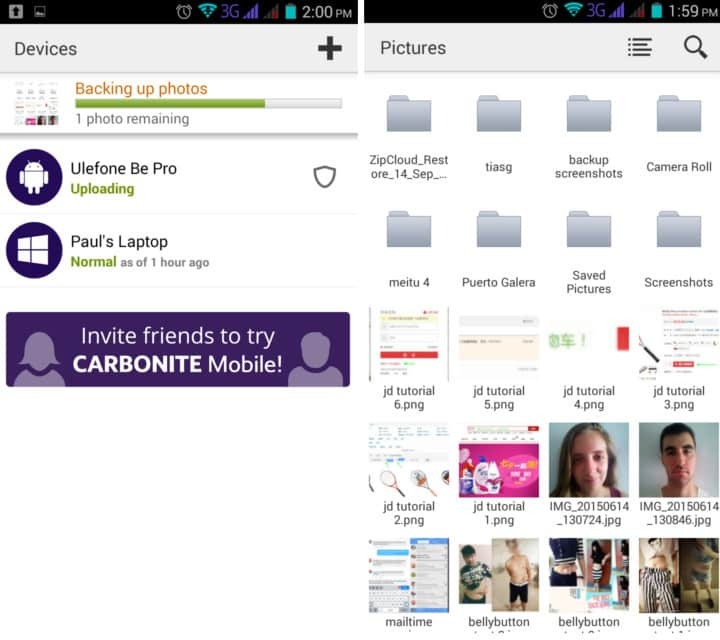 When browsing files in the app, Carbonite uses a modified version of Windows Explorer. That means you can easily preview the files, but it does not allow you to search the contents of files – only names and metadata. Carbonite can also add dots next to each file icon to show its current backup status (pending or complete). 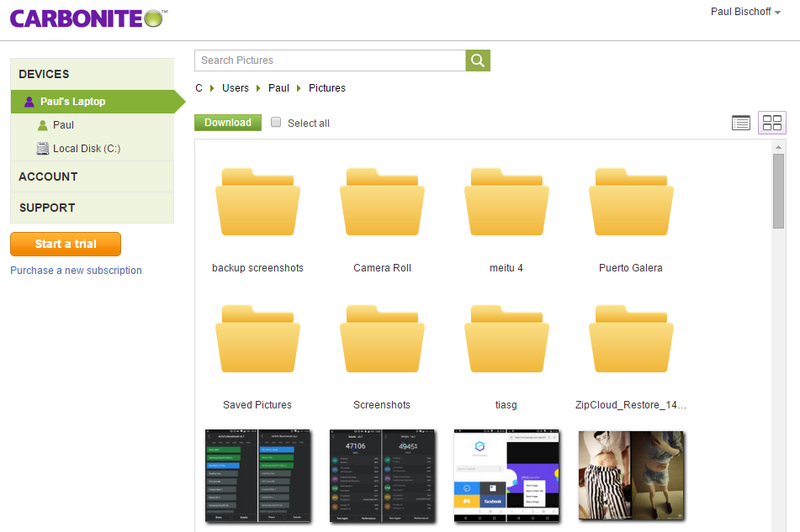 The web app for browsers isn’t much more than a simple file browser for your cloud backup and an account dashboard, but at least the search function works quickly and you can view photo thumbnails. Carbonite’s mobile app fares better in both design and features. You get access to all the files backed up from your PC and can enable automatic photo and video backup, which is fairly par for the course. There’s not option to automatically backup contacts, calendars, SMS, or other media, however. The search function works fast and you can switch to a tile view to see thumbnails of photos. Currently the app is available for iOS and Android only. Offline access is also useful for quick access to files without an internet connection. You can save any file locally to your smartphone by long-pressing it and clicking the Save option. While you can browse the files from your computer backup on a smartphone, the reverse is not true. There’s no way to access your phone’s backed up files from the desktop app. Thankfully, all your devices are accessible from the browser app. The app does have an ace up its sleeve in its anti-theft and loss measures. You can remotely activate your phone’s camera to snap a photo of a thief, locate your device via GPS, remotely lock the screen, sound the ringer to locate the phone even if it’s been muted, and remotely destroy all the phone’s data and perform a factory reset. Customer service is both responsive and knowledgeable. It’s available seven days per week between 8:30 a.m. and 9:00 p.m. on the east coast of the United States. Live chat, phone, and email are all available. On two occasions using the live chat option, representatives responded within five minutes and satisfactorily answered my questions both times. Carbonite’s website is thorough with detailed descriptions of all of its products including whitepapers and case studies on its tech. The service runs quietly in the background and doesn’t pester users with intrusive advertising or emails pushing for upgrades. How to cancel a Carbonite account isn’t immediately clear. Uninstalling the software–which must be done using Windows control panel as there’s no uninstaller included–apparently ends an account (at least in the trial version). Wipe all the data from your backup and keep close tabs on your credit card statement to ensure charges don’t continue. On the whole, Carbonite scores just below par in most aspects, but it doesn’t suffer from any major flaws, either. It could be prettier, but it’s not unintuitive. It could use more features, but these are more wants than needs. It could be more secure, but that will probably happen in the near future. Considering the price starts at less than $10 per month, Carbonite is certainly a competitive product. Online backupWhy should I pay for cloud backup when I can use Google Drive, Dropbox, and OneDrive for free? Online backupHow often should I schedule cloud backups? Online backupWhy are there different backup plans for personal and business use?